This gala of ~900 used a tent with sides that offered windows. The sides helped contain the sound while allowing guests to feel outside. Note the rigging. Red Apple Auctions has conducted four charity auctions this month. Three of the auction venues were scheduled to be tents. Two galas stuck to the schedule and held them in the tents. In one case, the rain poured. One gala moved to an alternate location (an airport hangar), just in case. In the fall and spring, tents are a popular venue choice. They allow people to be outside and enjoy the weather. They lend a dreamy feel to the night. I like them for these reasons. On the flip side, they are cumbersome (someone needs to set them up before you can start loading in your tables), expensive, and — if the weather doesn’t cooperate — a pain in the rear. 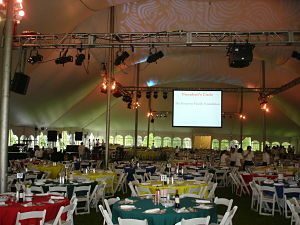 But most critical for your charity auction, tents offer special challenges when it comes to audio needs. If you’re not careful, no one will be able to hear the auctioneer, speakers, or anyone else. Sided tents contain the sound better than unsided tents. The evening breeze won’t flow as easily beneath the tent, but bidding will be brisk and guests won’t complain they can’t hear. Also ensure you have enough speakers to not only meet the needs of the guests in the tent, but to compensate for sound loss which naturally occurs as sound waves escape into the open air. If you look carefully, you’ll note that the tents featured in this post (the video below and the photo) opted to hang the speakers on rigging or tent posts. Hanging has the added advantage of keeping wires off the ground, where guests might trip on them.